I love Runner’s World magazine for keeping me up to date with running news and trends, but they don’t usually wow me with their recipes. No hard feelings. It’s not like I read the magazine expecting food blog inspiration. Their April issue recipe, however, caught my attention. Recently I’ve been thinking I need to experiment with more Asian flavors. I spent four years of my life in Japan, and have not blogged a single Japanese inspired recipe! My poor wok had been hiding in a dark corner of my kitchen, waiting to be used. Luckily Runner’s World provided me with this “you probably have most of the ingredients in your pantry” sesame peanut sauce recipe. 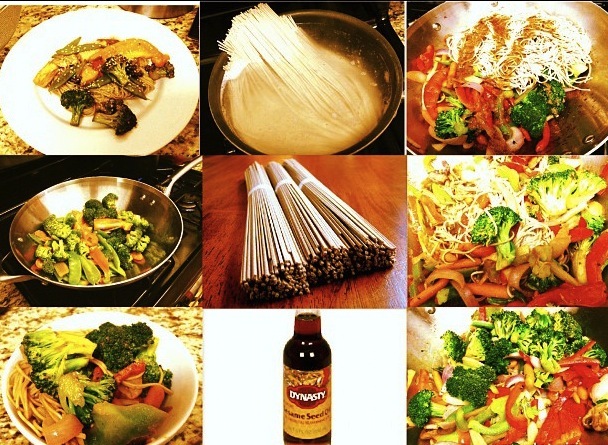 This sauce, along with soba noodles and stir-fried mixed vegetables has become a staple in the Lowry household. Depending on our mood we add chicken, or keep it vegetarian. Besides the versatility, what I love most about this dish is it takes twenty minutes tops to prepare. My personal record is fifteen minutes. Sesame Peanut Soba Noodles definitely do not look, or taste like they were thrown together in fifteen minutes. Boil three quarts of water in a large pot. In a large, shallow bowl, whisk the tamari, sesame oil, peanut butter, vinegar, 2 tablespoons water, ginger, and garlic. Set aside. Then, using a wok, heat a tablespoon of oil. Add vegetables and cook until tender, yet still firm. About 5 minutes. Add noodles to the boiling water and stir. Cook until tender (5 minutes). Drain in a colander; run warm water over the noodles until the water runs clear. (If the noodles aren’t washed, they’ll be starchy and sticky.) Drain thoroughly again. Add sauce to the vegetables in the wok and toss to coat evenly. Add chicken and noodles; toss again. Garnish with sesame seeds, peanuts, and/or cilantro. Yum! I need to make these! I love reading Runner's World especially when the issue has fun snack and dinner ideas. Thanks for sharing!